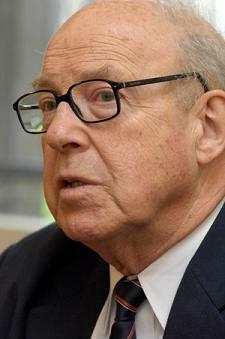 Hans Blix is the former head of the International Atomic Energy Agency and also worked as a UN weapons inspector in Iraq. He talks to SPIEGEL about whether Iran really has the ability to enrich uranium and if economic sanctions can ever be effective. SPIEGEL: Tehran has announced that it has enriched a “first batch” of uranium from 3.5 to 20 percent. Does this mean that we now face a new stage in the escalation of the conflict with Iran? Hans Blix: The government in Tehran originally declared that it only intended to enrich uranium to 3.5 percent, to produce fuel for nuclear reactors. But now it needs uranium enriched to about 20 percent for its research reactor, in order to produce isotopes for medical use. Tehran had the same problem once before, in the early 1980s. The United States had built a research reactor for Tehran, Iran had ordered nuclear fuel and had even paid for it, but then came the mullahs’ revolution, and America refused to deliver the fuel. The West has faced a dilemma since then: If we don’t supply them with the fuel, Iran has a reason to produce it itself. That’s what led to the compromise proposal of enriching Iranian fuel abroad. SPIEGEL: The West has been engaged in negotiations for years. How else can it accommodate Iran? Blix: Probably the best subject of negotiations is the location for exchanging low-enriched and highly enriched uranium, and there is an evident choice for that: Turkey. Both sides trust Turkey. SPIEGEL: How long will it take the Iranians to accumulate enough fuel for the research reactor? Blix: That’s completely unclear, and there are many people who even question whether they have the technical capability to enrich the material to 20 percent. SPIEGEL: So was Iranian President Mahmoud Ahmadinejad just boasting in recent speeches when he talked about Iran’s ability to enrich uranium? Blix: Much of that is bravado and a reaction to perceived humiliation. Anyone can see that he’s just trying to show off when he claims that the regime can build 10 enrichment plants. No one in the world has 10 of these plants. The United States and France have one or two, and Argentina and the Netherlands have one each. It’s absurd to talk about 10 plants. SPIEGEL: But if Iran is successful with its enrichment efforts, will that make it a “virtual nuclear power,” whereby all it needs to do is press a button and it will quickly have a deployable weapon? SPIEGEL: But what if Iran doesn’t want to step back? What if, in fact, Iran wants the bomb instead? Blix: I don’t rule out the possibility that Iran wants nuclear weapons, but I find the probability higher that the political leadership is divided over the issue. Merely the ability to enrich uranium already serves as a deterrent, and for some in the regime it might even be sufficient. If there is a desire to have the bomb, it certainly goes back to the 1980s and the threat coming from the Iraqi nuclear program at the time. But Iraq collapsed in 1991 and again in 2003, and if there is anything that makes me optimistic today, it is the notion that Iran, following the disarmament of Iraq, no longer has a security-related reason to acquire nuclear weapons. SPIEGEL: Doesn’t Iran feel surrounded by enemies? Blix: I don’t think the Iranians perceive Israel as a threat. The conflict between the two countries over enrichment is relatively new. Afghanistan? No. Pakistan? No. And not Turkey or Russia, either. SPIEGEL: And the United States? Blix: Yes. Aircraft carriers in the Persian Gulf are a different story. But this is precisely where we see the best options for a solution. In the case of North Korea, the United States offered a non-aggression agreement and the establishment of diplomatic relations. In the case of Iran, both options have not been discussed publicly to date. In other words, no one can claim that all the diplomatic options have already been exhausted. SPIEGEL: What other possibilities does the West have to stop the Iranian nuclear program? What do you know about covert US operations in Iran? Blix: I don’t have any evidence to support that, but it wouldn’t surprise me. The US Congress has approved millions for these purposes — not a very wise decision, by the way, because it just plays into the hands of the hardliners and harms the opposition. SPIEGEL: Now new sanctions against Tehran are being discussed. Do you think they make sense? Blix: Sanctions have certainly been successful before — just think of Libya. But it took a long time, and they are a blunt weapon. They were devastating in Iraq, where they harmed the people but hardly even affected Saddam. Whether sanctions can be effective against the Iranian Revolutionary Guard remains to be seen. In the case of North Korea, freezing certain bank accounts in Macau was obviously effective. Economic sanctions could certainly be appropriate, but I’m against military sanctions, because the only thing there is to bomb at the moment is intentions. SPIEGEL: The Israelis have more or less openly threatened to attack Iran’s nuclear facilities. Blix: Hardliners who analyze the drawbacks of a diplomatic solution today should, with the same scrutiny, analyze the drawbacks of a military solution. It’s easy to let the bombs fall, and a military strike could set the nuclear program back by a few years — something that would be very welcome. But what would the long-term consequences be? Iran won’t simply sit there quietly and accept an attack. SPIEGEL: Can air strikes even successfully destroy Iran’s nuclear program? Most of the facilities are buried deep underground. Blix: Anyone who’s worried that al-Qaida might be making dirty nuclear bombs in the caves of the Hindu Kush ought to be much more concerned about the fact that such air strikes can’t do much harm. Iran is a big, sophisticated country, and you can’t destroy or occupy everything. SPIEGEL: So you think a military strike would be pointless? Blix: I believe, at any rate, that it’s impossible to eliminate Iran as a potential enemy. Despite Ahmadinejad’s inflammatory speeches, Iran hasn’t been an aggressive, expansionist country in a long time. Besides, the glow that the mullahs’ 1979 revolution kindled throughout the region has disappeared. After the discredited election, and after the corruption they have permitted, the mullahs can no longer spark enthusiasm in anyone — neither the Iranians themselves nor anyone else in the region. Interview conducted by Bernhard Zand. Translated from the German by Christopher Sultan.